This article was published as an introduction to the January/February 2017 Digital Radiography comparison chart. You can view the chart here. The world of X-ray takes a big step into the future this year with scheduled Medicare reimbursement cuts under the Consolidated Appropriations Act (CAA) of 2016. Hospitals and clinics still using analog (film) X-ray machines now face a 20 percent reduction for exams conducted on these systems. Similar reductions kick in for computed radiography (CR) exams beginning next year. These cuts are meant to incentivize radiology to move away from outdated technology and embrace digital radiography (DR). While the benefits of DR are well understood, a full, immediate transition is not economically feasible for all hospitals, causing concern among many practitioners. Industry vendors have been working to provide solutions, and 2016 saw the introduction of several new products designed to aid the transition in different ways. Many of the new DR systems introduced in 2016 were designed for use in multiple settings, one of the easiest ways to increase value. Siemens Healthineers debuted the Multix Fusion Max at the 2016 annual meeting of the Radiological Society of North America (RSNA) last November. While designated as a “premium” system, the latest addition to the Max family of systems was designed to be low-cost and provide scalability to small and medium-sized hospitals. The system can be reconfigured to serve any mix of patients. The detectors can be swapped with those from any other Max system, ensuring minimal downtime and optimum utilization. Agfa Healthcare integrated fluoroscopy capability into the new DR 800 X-ray room, also unveiled at RSNA 2016. Fluoroscopy procedures can be performed in supine and upright positions. Users can conduct a variety of DR exams with the system, including abdomen, thorax, skeletal and weight-bearing. Shimadzu’s newest table-based system, the RADspeed Pro, offers the optional Edge package for advanced applications including tomosynthesis, dual energy subtraction and advanced auto-stitching. For some hospitals, doing a full-scale DR replacement is not an option. In these cases, radiology administrators may look to upgrade existing systems to DR capability, an option that several vendors are offering. Agfa introduced the Fast Forward to DR program last May in response to the CAA mandates. The program provides step-by-step guidance on how to cost-effectively upgrade within a hospital’s existing financial model. Agfa also introduced a new DX-D retrofit detector, the DX-D 60, in September that can be incorporated into any existing radiography room. The 17 x 17-inch detector offers a large field of view without having to rotate the panel between landscape and portrait orientations. New York-based JPI Healthcare Solutions introduced its own retrofit cassette, X-Vue DR Solutions, in September. The cesium-based detectors feature automatic exposure detection for easy install without connecting to a generator interface cable. The detectors fit any standard Bucky and offer advanced features such as stitching, DICOM modality worklist and procedure code mapping. Some of the newest systems have focused on improving productivity and workflow for more efficient operation and cost control. Virtual Imaging, a Canon subsidiary, debuted a DR tablet solution at RSNA 2016, integrating tablet functionality with any Canon wireless CXDI DR system. The tablet includes the newest CXDI Control Software NE with optional scatter correction. This provides grid-free imaging to streamline workflow and make positioning more comfortable for patients. Samsung introduced a new mobile DR system, the GM85, which sports a collapsible column to easily navigate congested spaces. The U.S. Food and Drug Administration (FDA)-cleared system offers its own version of gridless imaging called SimGrid, backed by the S-Vue imaging engine for enhanced sharpness and clarity. Fujifilm also introduced a new mobile DR system at RSNA, the FDR AQRO. It offers the high-end, dose-saving features of a premium system on a mini mobile cart, including Virtual Grid image processing software to reduce dose techniques as much as 50 percent. While several new systems were introduced this year, vendors also made enhancements to the detectors that allow image capture. Rayence introduced the C-Series wireless detectors at RSNA, featuring 10 x 12-inch and 17 x 17-inch models. Both panels offer user-activated internal storage of up to 200 images, and can even perform image acquisition when there is no computer or network connection available. The 10 x 12-inch model is suited for extremities, neonatal and other pediatric exams, while the large 17 x 17-inch model can capture the widest chest or pelvic images. Productivity enhancements include the ability to register panels across multiple workstations, and auto-triggering technology that signals the start of image capture without direct X-ray generator integration. Konica Minolta expanded its AeroDR family of wireless detector panels this year with an HD entry that offers high X-ray sensitivity with smaller pixel sizes for a resolution of 100 microns. The panel can store up to 100 images internally, and is highly rated for drop and water resistance. 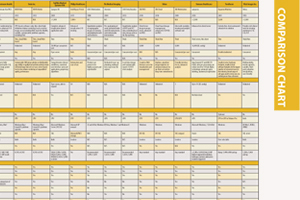 ITN has created a comparison chart for specifications for digital radiography systems, both fixed and mobile. It can be accessed at www.itnonline.com/content/digital-radiography-systems. This will require a login, but it is free and only takes a minute to register. The chart includes all manufacturers of mobile C-arms that sell systems in the United States.